Brig. 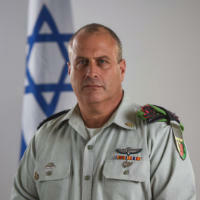 Gen. Yehuda Fox was born in 1969 and currently serve as a Senior Visiting Fellow at the International Institute for Counter-Terrorism (ICT) at the Interdisciplinary Center (IDC) Herzliya. 1999 - 2001 - Commander of the "Shaham" battalion of the "Nahal" brigade. 2001 - 2002 - Acting Deputy Commander of the "Nahal" Brigade. 2004 - 2006 - Served as the Diversionary Operation Officer of the "Galilee Division” . 2008 - 2009 - Served as the Command Operation Officer of the Southern Command. 2009 - 2011 - Served as Commander of the Officers' School (Training Base 1). 2012 - 2014 - Served as Commander of the "Nahal" Brigade. 2016 - 2018 - Served as Commander of the "Fire Fox" Division (former “Gaza Division”). Brig. Gen. Fox holds a LLB in Law from the Interdisciplinary Center (IDC) Herzliya and a MA in Security Studies from Haifa University. He also served as a Wexner Foundation Fellow at Harvard University.